As Mechanical Ventilation with Heat Recovery (MVHR) systems grow in demand, what advice should wholesalers give to customers who are keen to install MVHR but don’t know how to specify the technology? Christian Rehn, National Design and Project Manager of National Ventilation, explains how ventilation system design can be made simple. Mechanical Ventilation with Heat Recovery sales are on the rise. And with MVHR increasingly the ventilation system of choice for new builds, now is an ideal time for electrical wholesalers to work with small to medium-sized contractors to help them grow their ventilation businesses by taking advantage of this developing market. But when it comes to new build ventilation projects, contractors will need to be familiar with the design and specification of whole house ventilation technologies, such as MVHR. The only hurdle is that specialist knowledge of the equipment or software programmes is often needed to correctly calculate the pressure in the system over a given length of ducting. So what can wholesalers do to help their customers? Lending a helping hand to your customers may make a big difference as to whether a contractor wins or loses a job. Ventilation design and specification may be daunting for some contractors who may not know where to start when asked to design an MVHR system – which could potentially lose them the business. Fortunately, there are design services available, such as the free service that National Ventilation provides, to help electrical contractors secure these projects and grow their business. Through its close relationship with electrical wholesalers, National Ventilation specialises in offering a free design service for self-build and design & build projects to help contractors win business they might otherwise have walked away from. National Ventilation assists electrical wholesalers by sending them all the necessary information that’s needed for their customers to help them with their ventilation system design. Wholesalers can then supply their customers with a full design and quotation including unit calculations, a full kit list as well as recommended duct routes, making the process simple for wholesalers and customers alike. To help generate sales of MVHR it is also useful if electrical wholesalers are familiar with the simple steps needed to design and specify a ventilation system so that customers know what is entailed. The first step in designing a ventilation system is for the contractor to obtain project drawings from the architect or developer and supply these to their wholesaler. This is then passed onto National Ventilation to enable them to specify the correctly sized ventilation unit and the correct type and lengths of ducting – whilst ensuring it meets Building Regulations. Using the architect’s drawings, property details are input into an airflow calculator. This will include the dimensions and types of rooms in the property so that the MVHR system can meet the airflow demands of each room. Once the total airflow figure has been calculated an MVHR unit can be selected to meet this need. It is important to specify the correct unit for a property, as different MVHR units will offer different configurations. We design systems that ensure the MVHR unit is never working at more than 75% of its maximum capacity, ensuring that the unit works quietly and efficiently. The next step in ventilation design is to decide where best to locate the MVHR unit, risers and ducting. The loft is an ideal location for the MVHR but in properties with vaulted ceilings an alternative location is needed such as a utility room or a plant room. It’s also important to consider the building design and whether the ceilings have voids to run the ducting or webbed eco joists where the ducting can be run. 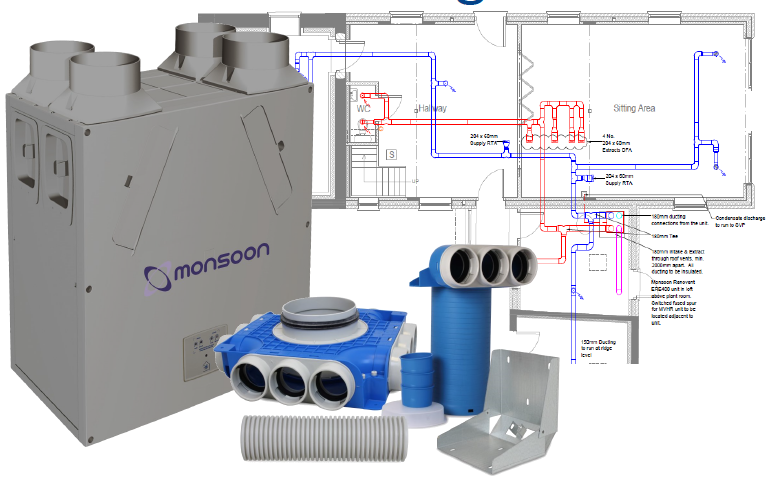 When it comes to MVHR systems, contractors can be put off by the arduous and specialist nature of traditional plastic ductwork but there is now a cost effective, simple alternative. Switched on electrical wholesalers can advise their customers that semi rigid ductwork, such as National Ventilation’s Monsoon Radial ducting, is ideal for smaller developments since it is flexible but robust with an outside diameter of just 75mm and, critical for ease on-site, it is up to 60% quicker to install. This type of ducting also means fewer mistakes, since even a novice can install it to a high standard, with a Stanley knife the only real tool needed to install it, resulting in an airtight installation and improving system performance. With a range of plenums and accessories available, this system can overcome over 99% of issues that may occur on site, welcome news for contractors. Once the location of the MVHR unit, risers and ducting has been decided the next stage is for the electrical wholesaler to receive the design and quote. This is supplied with detailed calculations, proposed ducting layout, where to put the MVHR unit and risers and how to control the unit, making everything simple and straightforward for the contractor. However, quite often, plans only tell half the story and contractors can often be caught out if things such as steels don’t show up on the original plans. The knock-on effect of this can be a need for additional materials that haven’t been considered in the original calculations. This could result in an unhappy customer, which is far from ideal. We can overcome this with a free pre-order site visit to ensure the design will perform as intended. A service like this is a great trouble shooting exercise and is also a good opportunity for the electrical contractor to learn more about the installation process, thus encouraging future potential orders for the electrical wholesaler. By using a free planning and advice service, electrical wholesalers can be confident that they will be able to speak knowledgeably to customers and help them gain new contracts through providing this information. Therefore both wholesalers and contractors can be safe in the knowledge that the system is well designed and fit for purpose and that there is a point of contact that will assist them throughout the whole job. Pictured top: The first step in designing a ventilation system is for the contractor to obtain project drawings from the architect or developer.